Jenni (left) and Pamela enjoying goodies at work! I'm really happy that Jenni messaged me asking to do an interview, because I've never heard of anyone with her role before! I unfortunately wasn't able to visit ESPN Wide World of Sports during my program, but it's really cool to hear about her experience since it's so different from many other jobs for college program cast members! 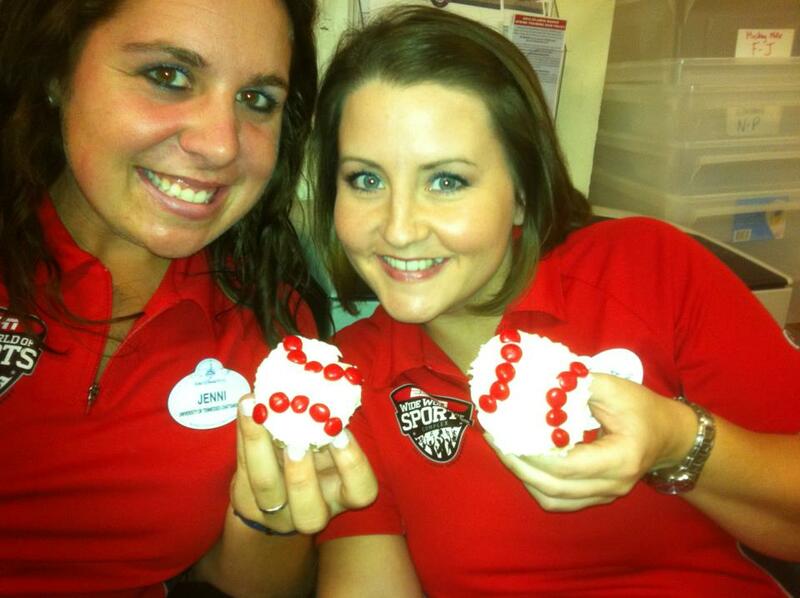 My role during the DCP was Guest Relations/Box Office at the ESPN Wide World of Sports. I originally applied for Main Entrance Operations as my number one choice. My undergraduate major was Sports Administration and during my phone interview the lady asked if I would want at all to be placed at EWWOS. Of course this wasn’t what I expected, but it was perfect for me. Unlike some roles, my typical day varied. During the first month I was there, I was often an usher for various events including cheer and dance competitions as well as youth basketball games, just to name a few. Right before the Atlanta Braves Spring Training started, I was sent to train in the box office (which meant a little more pay since I was handling money). During Spring Training and after, I spent most of my time in the Box Office selling tickets; often for multiple sporting events at once. During Spring Training and RunDisney events, I often had 6 AM shifts and would end up getting extended because of constant, unexpected rushes. During non-peak sporting event times, I was often deployed to the theme parks to work main entrance operations (turnstiles.) My favorite was Hollywood Studios because you got to hear the parade! I also did a few shifts at Epcot and Animal Kingdom and even was given a few PAC Shifts (which I would definitely suggest doing, but be prepared; you will get asked TONS of questions). This isn’t the role I was expecting to have at all when I applied for DCP. Heck, I don’t even think I knew how big of a deal this place was (which many of you may not if you aren’t a huge sports fan). I’ve always worked in sports so this was the perfect place for me to spend my DCP. My favorite parts about my job were definitely that I was constantly surrounded by sports but also the excitement of athletes leaving our complex to head to the parks to play. I was given the opportunity to be sort of a hub of knowledge of ALL things Disney. I got to interact with people from all over the world, as we often held international competitions. I also got paid to watch Atlanta Braves spring training so that was pretty awesome. My least favorite part, at first at least, was getting deployed and having literally no idea what I was doing or where I was going. However, whenever I would tell other cast members I was from the Wide World of Sports, they would seem to take pity on me and help me out in any way possible! Specifically working at EWWOS, my least favorite part was sort of the monotony that comes with selling tickets. However, there was a different event every single weekend which made for an interesting time for sure. Jenni and her roommates in Magic Kingdom! There is one very special magical moment that happened while working at the Wide World of Sports. I was standing around working turnstiles (which can also get boring at the complex after the huge rush comes in) and I began talking to a little boy named Chase. His dad would bring him once a spring training to let him watch the Braves practice. The previous year, Chipper Jones (a Braves baseball player) had given him his batting gloves after practice and he just really wanted to get them signed. Chase had heard that Chipper would walk out the main entrance so he was waiting to find him. He had almost given up and went back to find his dad inside the complex. I saw Chipper walk out (I’m a HUGE Braves fan so this was definitely to my advantage and of course I wasn’t allowed to talk to him myself) and I found Chase to let him know which way he went (which sounds sort of creepy, but I guarantee it’s not!) Chase got Chipper’s attention and he signed his batting gloves and I swear I’ve never seen a kid so happy. 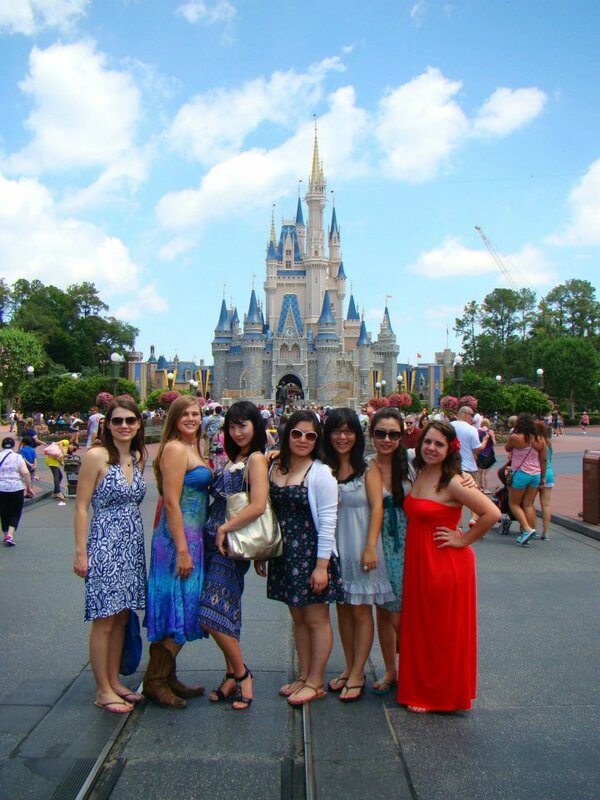 Since my freshman year of college when I’d heard about the Disney College Program, I couldn’t wait to do it. However I played softball for my college so I didn’t really have the opportunity to… Until I made the decision my senior year to not play and hope that I got this opportunity I’d wanted so badly. I didn’t know anyone who had done it, but really nothing in the world seemed better than getting to live and work at the Happiest Place on Earth! No, I think I was pretty prepared. You definitely work a lot but I was expecting that before I went into it. Some parts can boring at times and you’re definitely going to work with some older people and people that you may not have anything in common with (this is true to any role/job ever.) Also invest in a really good pair of tennis shoes… your feet will definitely hurt. Have an open mind!!!! We had 8 girls in our apartment and only 3 were American. I lived with 3 girls from China and 2 from North Korea and had my eyes opened to a very huge culture shock! We celebrated Asian New Years and often got to experience their very own cooking. Also, don’t be afraid of doing things by yourself. I learned SO much about myself as a person and definitely became much more self-aware. I went by myself to the parks a lot more than a lot of people, but those were often the times I met amazing people and got to share my experiences. One time at Epcot, I was having dinner by myself and ended up meeting two chaperones from a school trip and told them all about my experiences doing the DCP. After all the great things I said about my experience, they both wanted me to talk to their kids about it. I often had secret tips I could share with guests that I may not have normally been able to if I was talking to my friends. Of course going with friends is fun, but don’t miss out on awesome opportunities just because you may be scared to go alone!